In this series of blog posts we've walked you through getting WinDBG installed, setup, and got you started by attaching to a process and setting breakpoints. Our next step is the actual debugging part where we're stepping through a program and looking at memory. Really the whole reason you're using a debugger is to inspect the state of a process during a specific operation or function. Just about every instruction that gets executed alters the program state in some way which means having the ability to execute an instruction then inspect the state is extremely important. The first part of this is "stepping" - executing instructions then pausing. WinDBG offers a number of different stepping commands depending on where you are in the program and where you want to go. Step-Into - When the instruction is a call, follow the call and pause at the first instruction in the called function. Step-Over - When the instruction is a call, execute the function and all subfunctions, pausing at the instruction in the current function after the call. A note to make here is that both Step-Into and Step-Over will execute a single instruction and pause - behavior only changes when a call instruction is reached. The g (Go) command is more of a breakpoint command but its functionality blurs the lines between breakpoints and stepping commands. It's used to resume execution of program but unlike most of the stepping commands, it not really meant to be used on an instruction by instruction basis. g will resume the program until a breakpoint or exception occurs. Really, you would use g to execute all of the instructions up to a breakpoint, whereas with stepping commands you're executing instructions without setting a breakpoint. However, to clarify, debuggers will pause when hitting a breakpoint regardless if you use a stepping command or something like g.
Executing a single instruction, then pausing is called Single Stepping. This can be achieved by either using the "Step-Into" or "Step-Over" commands since both behave the same on non-call instructions. Rather then show them both here, let's look at these commands individually. Here we can see that we were running within notepad!WinMainCRTStartup, then on the call we used t to follow the call into the notepad!__security_init_cookie function, where we paused on the first instruction. 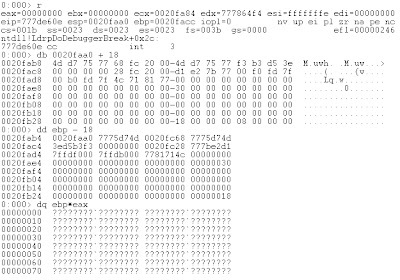 Here we can see that the instruction after the call to notepad!__security_init_cookie is push 58h. When we Step-Over with p we automatically execute everything within the notepad!__security_init_cookie function, then pause at the push after it. In this example, if pause at call somefunc, then use tt, we'll end up pausing at the ret in someotherfunc. Ultimately it depends on what you, as the person using the debugger, want to do. This will show us the values on the stack. With d, WinDBG will display data using the format specified by the last d command executed. If this is you're first time running d, it doesn't have previous command stored, so WinDBG will give you the output of the db (Display Byte) command. So far we've just been looking at the memory that esp is pointing to by using esp as the parameter to our memory inspection comman however there are a number of different ways to reference memory that can be useful when starting out. 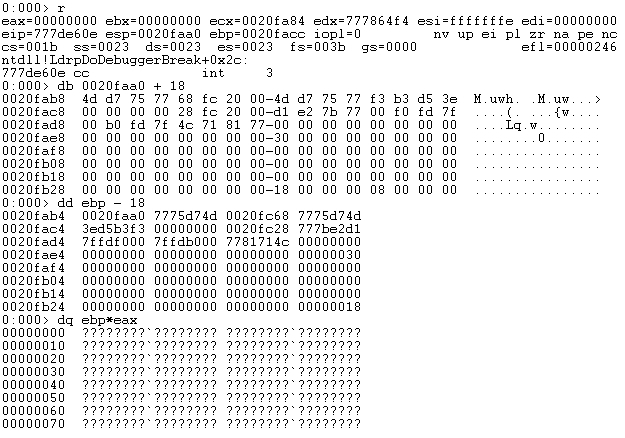 WinDBG will output question marks (?) for invalid/free memory. The number specified with L is the size, which is related to the command executed. For instance, with db, L will mean the number of bytes to print, while with dd, L will mean the number of DWORDS. That's really it to get you off the ground inspecting memory - I know, three blog posts building up to this functionality, and its just this tiny little section? Yup - there are some more memory inspection commands, but to get started, d is the core command. Check out the tips below for more info. Now that you're off the ground, lets look at some handy tricks and tips that can make your debugging experience much better. F6 - Attach to a process. With the Attach Window open, use the "End" key to drop down to the bottom (where newly launched applications are). ...who needs calc.exe when you have WinDBG! To make life easier, there are a number of extensions that people have created for WinDBG. These are great little tools that can be used within the debugger to provide functionality. Some are even built by Microsoft. The useful ones are !heap, !address, !dh, and !peb. I'll cover these and more in another blog post - So stay tuned! Got any more tips or tricks? Share them in the comments below! Fixed - thank you very much!